I asked to translate them when, after the festival was over, Gabriel asked Yiorgos Chouliaras, and he in turn asked me, what might have happened to those haiku, which I had saved. At the same time I asked both for their help and I am grateful for their generosity. 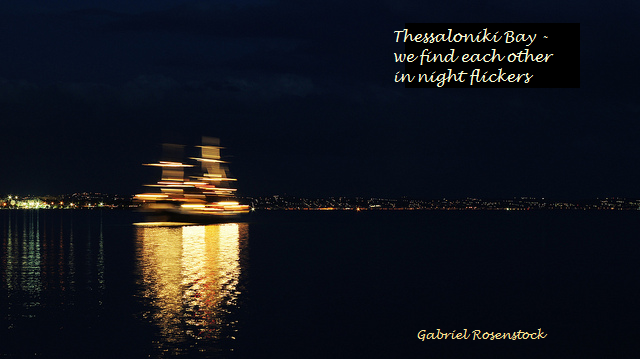 Gabriel Rosenstock is considered a haiku master internationally. This fact compounds the intrinsic difficulty of translating haiku from English to Greek. For metrical reasons, in my versions Thessaloniki Bay, has been replaced by Thessaloniki which is just as familiar to Greek readers. I have also placed the haiku into a sequence from “the beginning” to a “farewell”. The meeting of a major poet’s sensitivity with the sheer silence of a perpetually co-reigning city capable of inspiring him appears as self-evident in the eyes of a woman born in Thessaloniki who feels homeless as she must live in Athens. It is also one of those miraculous incidents which confirm my naïve (un)certainty that some things just happen so as to allow such a meeting of persons, ideas, things… Poetry is indeed a meeting place as it rather involves such a loving interweaving in time as well as a way for us to realize how fascinating life could be despite uncertainties; a perpetual reconsideration of the fascinating fact of our own existence. Let us surrender ourselves, imperfect and uncertain, as translators and readers, to this meeting through the mutual assumption of our fundamental weakness that can only deepen, I think, our mutual understanding and communication. are you the end or the beginning?